Lawns cut and edges trimmed each visit during the growing season. All grass cuttings to be collected and removed from site unless mulching ride-on mower is used. Various shrubs and bushes pruned as required throughout the year according to their requirements. Overhanging low tree branches lopped as necessary. Cut, shaped and reduced as required throughout the year. Hoed and weeded regularly throughout the year and dug over. Edges redefined where necessary. Ivy kept from climbing up the walls. Cleared and collected during the autumn from all areas. Car parks and paths regularly swept & blown, all debris/litter collected and removed from premises. Removed and disposed from premises or removed to a compost area . Paths and car parks treated with weed- killer as necessary . To be organised on a separate order. Neat & Stripy observe the conditions of Health & Safety legislation. All teams demonstrate a mature and enthusiastic approach to safety at all times. Vans and equipment are always in good working condition and regularly serviced. 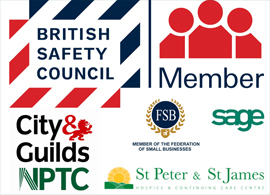 Our Neat & Stripy team are trained in the safe use of equipment and it is our policy to wear safety footwear and protective gear when necessary.